The lens in a machine vision application is where data passes first, making it an essential component in your vision system. When choosing a lens, it’s important to keep in mind the focusing type, iris type and focal length (the space from the lens’ optical center to the imaging sensor surface). The focal length calculates the magnification, and is determined by the Working Distance, or the distance between the camera and the inspected object. 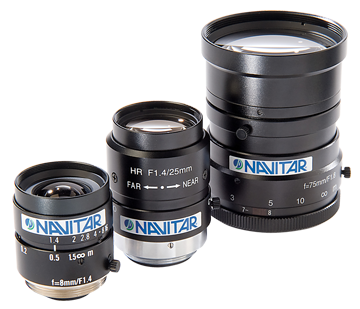 Lenses can have either variable or fixed focal lengths. Focus reflects how clearly the sensor replicates the original image, while the iris type controls the amount of light that touches the sensor. Focus, focal length and the camera iris can all be adjusted manually or automatically. While focus, iris type and focal length are important, there are several other factors that should also be considered when choosing a lens. The size of the object is needed to define the Field of View, and the defect to be detected affects the sensor resolution and pixel size. Lighting and motion are also key elements. Knowing if lighting can be controlled, if the object emits light itself, or if there is ample light in the environment all affect the lens type. Motion of the camera or detected object – Are they stationary or moving? If in motion, how quickly are they moving? – impact both shutter speed and the light entering the lens. HTE Automation is dedicated to providing the resources Kansas, Missouri and Illinois manufacturers need to maximize the return on their investment in machine vision camera lens technology.